The presence of near-extinct Sumatran rhinos in Indonesian Borneo was for a long time the stuff of legend, with no hard evidence to support it. Still, wildlife experts spared no effort to investigate every scrap of information. Those rumors eventually bore fruit with the capture of two individuals by conservationists in the past two years. The first rhino, however, died of injuries sustained before its capture. Today, a facility in eastern Borneo holds the other rhino, a female, with around-the-clock care from vets and experts, as part of a wider effort to kick-start a captive-breeding program. In 1982, an orangutan researcher working in Indonesian Borneo wrote to a colleague at the biology department at the National University in Jakarta. He told of meeting a traditional-medicine trader at the market in Pangkalan Bun, a city in Central Kalimantan province. 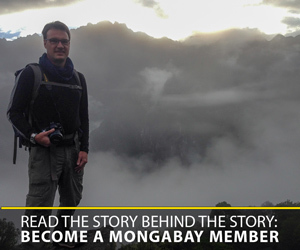 “A whole Sumatran rhino head is immersed in coconut oil in a basin,” Muhammad Boang wrote. “That oil is later put into little finger-size bottles, and sold for 5,000 rupiah,” nearly $8 at the time. “It’s believed to cure various ailments. According to the trader, the rhino came from the forest in Tanjung Puting,” at the time a newly established national park. Three decades later, environmentalists from the Titian Foundation would once again get information of Sumatran rhinos (Dicerorhinus sumatrensis) in Indonesian Borneo, this time in East Kalimantan province. In 2012, the foundation’s founder, Darmawan Liswanto, received reports of rhino sightings in the Mahakam Ulu foothills upstream of the Mahakam River. The area includes the Kelian Lestari protected forest, and was formerly a mining site spanning 67 square kilometers (26 square miles). 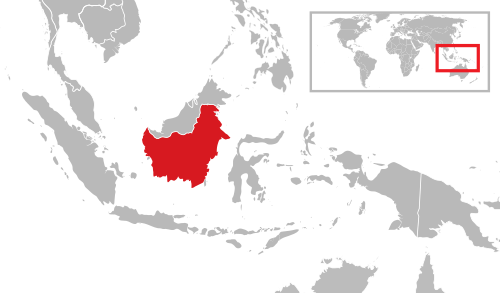 The Indonesian part of Borneo island, known as Kalimantan, is shown in red. Image courtesy of Gunkarta/Wikimedia Commons. The presence of Sumatran rhinos in Indonesian Borneo was for a long time the stuff of legend, with no hard evidence to support it. The species was considered locally extinct, until WWF-Indonesia found signs of a rhino there in 2013. Early that year, an orangutan survey team from the NGO found fresh tracks believed to be from a rhino. The discovery prompted more intensive surveys, including setting up a camera trap and interviewing residents across West Kutai district, East Kalimantan province. The interviews indicated that there were pockets of potentially viable habitat for Sumatran rhinos in East Kalimantan. The surveyors identified these as Habitat Pockets 1, 2 and 3. Field surveys in Habitat Pockets 1 and 3 found signs of a rhino presence, including footprints, droppings, half-eaten vegetation, mangled branches, scuffed tree bark, and mud wallows. In mid-2013, a camera trap recorded a rhino in Habitat Pocket 1. On Oct. 2 that year, the forestry minister announced the rhino discovery at the Asian Rhino Range States Meeting taking place in Lampung, Sumatra. In 2014, a series of systematic and collaborative surveys were begun to uncover the rhinos’ population and distribution. In October 2014, locals reported finding rhino tracks in Habitat Pocket 3. The area was already under threat from human activity, including hunting, logging, clearing, burning, mining, and cultivation of oil palms. “The results of a 2015 survey by WWF-Indonesia and Mulawarman University indicate there are more than 15 Sumatran rhinos in Habitat Pocket 1,” Yuyun Kurniawan, from WWF-Indonesia, said in a Population and Habitat Viability Assessment (PHVA) presentation that year. Locals had also reported a rhino presence in Habitat Pocket 2 since 2013. But surveys by WWF-Indonesia and the Alliance for Forest Conservation (ALeRT) from 2016 to 2018 turned up no evidence of rhinos there. Since 2013, meanwhile, there were three rhinos known to live in Habitat Pocket 3, all females: Najaq, Pahu and Tenaik (Pahu’s calf). But conditions are increasingly dire for the rhinos there, surrounded by mines and oil palm plantations. Najaq was captured on March 12, 2016. She died on April 5, from wounds inflicted by a snare. There are no signs at present of Tenaik, believed to be about 5 years old. 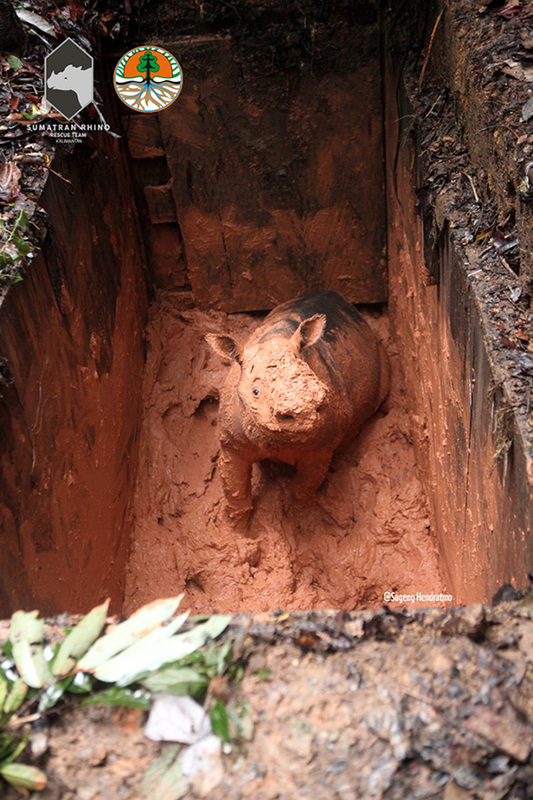 A Rhino Protection Unit (RPU) set up by WWF-Indonesia, the Indonesian Rhino Foundation (YABI) and the East Kalimantan conservation agency (BKSDA) found 250 snares and traps in a three-month period in 2016, set up to hunt wild boars and deer. Najaq before her death in April 2016. Image by Ari Wibowo/WWF-Indonesia. The morning of Nov. 25, 2018, was a memorable one for the Sumatran rhino conservation community. That was the day Pahu was successfully and safely captured. Three days later, she was transferred to the Sumatran Rhino Sanctuary (SRS) in Kelian Lestari. Wiratno, the conservation chief at the Ministry of Environment and Forestry, said the translocation was an important first step in the effort to boost conservation of the Sumatran rhino. He said the government was fully committed not just to the capture of rhinos for conservation and captive breeding, but also to the protection of their habitats. “Our hope is that the population of the species will recover,” he said. At the Kelian Lestari SRS, a team of veterinarians and experts are keeping close tabs on Pahu, ensuring she remains safe and healthy in her new environment. The Sumatran rhino is one of the mammals most at threat from extinction. With a population of fewer than 100 individuals, the species is at a critical point. For years it was hunted and saw its habitat destroyed. The population that remains is now scattered, making it difficult for individuals to find each other to mate. As a result of this prolonged isolation, the captive-breeding effort itself poses a risk to the fertility of the rhinos. Whether the species survives depends on the conservationists’ ability to capture and transfer the rhinos to facilities specially built for their care. The Kelian Lestari SRS where Pahu now lives features a high diversity of plants. These include plants whose leaves or fruit the rhinos like to eat, such as blackboard tree (Alstonia scholaris), Vitex pubescens, bandicoot berry (Leea indica), purple simpoh (Dillenia excelsa), native hibiscus (Hibiscus tiliaceus), and different kinds of fig trees (Ficus spp). Any rhinos kept here will only be given food that can be found in the nearby forest. Additional food is limited to jackfruit (Artocarpus integra) or rubber fig (Ficus elastica) leave, which can be obtained from nearby villages. Even then, the SRS staff have to ensure that the leaves don’t come from farms or plantations that use pesticides. Rhinos become susceptible to disease if their diet isn’t diverse enough or is contaminated with pesticides. If, over the next year, conservationists are unable to capture and move any of the rhinos in Habitat Pocket 1 to the Kelian Lestari SRS, an important decision needs to be made. One of the males currently at the Way Kambas SRS in Lampung, Sumatra, must immediately be sent to Kelian Lestari to mate with Pahu. 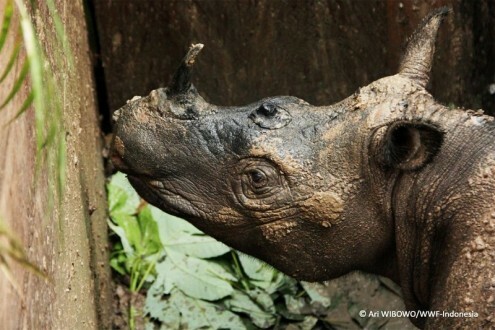 It’s important that this happen for the Sumatran rhino conservation program to work as hoped. Pahu was captured from a forest in East Kalimantan by conservationists in an effort to protect the near-extinct species. Image courtesy of Sugeng Hendratmo/Sumatran Rhino Rescue. Haerudin R. Sadjudin is a senior rhino researcher who has been involved in rhino conservation program for over 40 years in Indonesia. The story was first published on our Indonesian site on Dec. 2, 2018. Editor’s note: For an alternative view of the capture of Najaq, see this 2016 commentary by Erik Meijaard.